The Nazionale CSEN (Centro Sportivo Educativo Nazionale) is a culmination of competitions from all over Italy which sees competitors battle it out for the opportunity to represent their home region at the event. The 2018 event took place in Cattolica, two hours south of Bologna, at a world class equestrian facility with an enormous indoor arena and multiple outdoor ménages with fantastic surfaces. Neil Ellis was thrilled to be asked to represent the UK as a judge. He sent us this report. 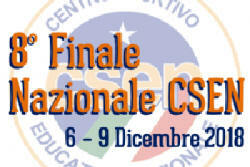 CSEN is an organisation that has helped rapidly increase the participation levels in Agility across Italy, and sits within the FIDASC organisation. FISASC is recognised by the Italian Olympic Committee and has ambitions of great things for agility. The men behind the idea were Massimo Perla, a prolific and extremely popular dog trainer, known for his services to the film and TV industry for many years and Francesco Brescia, a popular individual working for both organizations and a figurehead in driving agility across Italy to new levels. The competition runs under WAO (World Agility Open) rules and coincides as the Italian WAO team selection weekend, consisting of four days of gruelling competition over testing courses across Games, Biathlon and Pentathlon, disciplines of the WAO finals held every May. These CSEN Finals also saw Obedience, Discdog, Sheepdog and Rally Obedience competitions take place, with over 600+ dogs entered over the weekend. There were eight judges for the event - five Italian, one Finnish judge (Marko Mäkalä) and two from the UK - Becky Dixon and me. We were responsible for the opening days Games classes, and for the rest of the weekend, alongside Marko, we did the Senior Pentathlon classes. The Biathlon event on Saturday also ran as the Italian National Championships and was judged by two officially recognised Italian FIDASC judges. As well as this, there was a Junior event running and children's competition, so it was a jam packed schedule over the four days. I am in total admiration of the organising team and the schedule they religiously kept to which kept the competition run as smoothly as possible. What makes this competition unique is the fact that you share the judging of all the classes. For example, on courses you designed you would judge two heights, and you would also judge two heights of a course one of the other judges had designed. This meant that you only judge a maximum of 150 dogs per day. There were no interruptions and, from a judge's perspective, it keeps you a lot more focused because you would handover to your colleague after judging a height of only 70 or 80 dogs. This is a great initiative and, with careful planning, I believe something that could be instigated in the UK. The level of competition is fierce with regular clear run times hitting over five meters per second across all heights. The large ring sizes (30m widex 40m long) lend themselves to course lengths over and above the 190m more often than not. Like Agility worldwide now, the handling is physical, with acceleration a key ingredient to many aspects of the courses that were seen. It's an exciting time which is influencing the adjustments we make to the training of our current dogs and changing how we teach younger dogs. It was fantastic to see Agility of all levels represented by individuals as young as seven and as old as 70 at these Finals, testament to the participation levels seen across Italy. The children's competition saw under 18s & 14s competed on the Saturday with a WAO spot up for grabs for the best Under 18 from across the four heights. This is a fantastic initiative to expose young children to international competition so early on in their Agility careers. 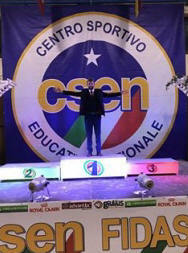 The standard was excellent and junior agility has a very bright future in Italy. 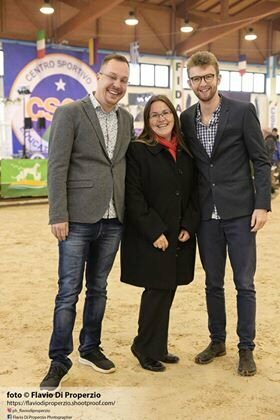 I would like to congratulate the CSEN competition organisers once again for putting on a fantastic event, and I hope that it continues to grow in size. It is a great competition that produces fantastic Agility. Thank everyone for welcoming me and being so accommodating. I hope I get the chance to return very soon. This was my 14th judging appointment of 2018, under four different organisations with three overseas trips to two different continents, all with one thing in mind - designing courses for everyone to enjoy. I try to judge to the best of my ability and share the experience of this fantastic sport with others all over the world. This is a passion reciprocated everywhere I have been from the hospitality and food to the willingness from everyone to learn and see how things such as course design is done differently. I am extremely excited for the future of Agility, and honoured to have a front row seat to witness this progression. Please visit my website for all my course plans from 2017, 2018 & 2019. I will continue to publish these for all to see and use. Neil Ellis is a 25 year old nurse by day. He started out in Agility at the age of 11 and got his first dog at 13. 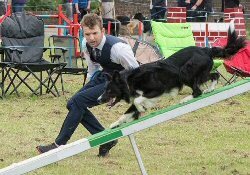 Since then, Neil has attended two European Championships, collected five Championship Certificates and two Reserve Championship Certificates with three different dogs amongst other senior finals, and has gone on to be one of the leading judges in the UK. At 24, Neil became an approved Championship level judge and was accepted into the Kennel Club as a member. Neil has continued to pursue his judging career, now into it's 11th year, with regular trips internationally, as well as regularly judging qualifiers for the top finals across the UK.